It was a short holiday and I miss it already. I’m back from spending a week in Las Vegas. It was a very busy trip with nothing but sight seeing, walking and gambling. The amount of people at any given time of day in any casino is quite overwhelming. I had some great food at the all you can eat buffets and tried out some very nice steak houses and delicatessens. On the way down and back I had to switch planes in Denver, CO. I’ve never been to a bigger airport than the one in Denver. For those that haven’t passed through there, it’s one big long terminal made up of 138 gates on 3 concourses. To give you an idea of the size, it took me 24 minutes to walk from gate 13 to gate 93 to ﻿catch my connecting flight. They have moving sidewalks too, but I needed the exercise. As far as gambling goes, I won $12 and only spent $2 at the Monte Carlo. I quit while I was ahead! Hey, at least I won something. Makes me want to test my luck on the best websites for slots. Many people in the casinos were stressed out by losing and kept on feeding the machines. I saw one lady with $300 and lose it all over again after 10 minutes. Below are a few pictures from my trip. I took over 700 of them, but for the purpose of this blog and the fact that I have a life, I won’t post all of them. Enjoy! I’m here! 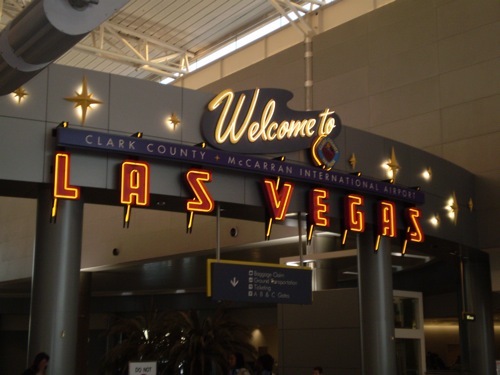 Finally after a long day of flights I arrive at the McCarran International Airport in Las Vegas. This is the hotel I stayed at. 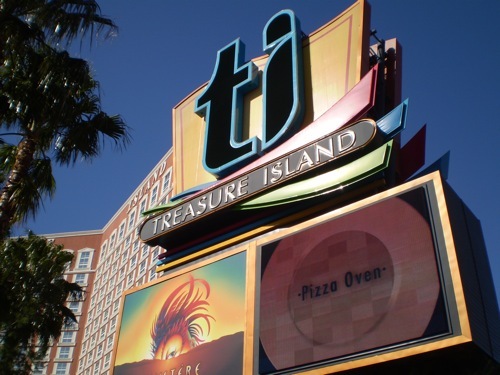 Treasure Island (TI) was a wonderful hotel and casino with outstanding guest service and endless amenities. The food at the buffet was also top notch and I think I gained about 15 lbs. This is an outside shot of TI at night. In front of the hotel is a pirate ship for the show they do 4 times a night called the Sirens of TI. Lots of smoke and explosions accompany the show and leave you standing with your jaw dropped at the end. Fabulous performance! 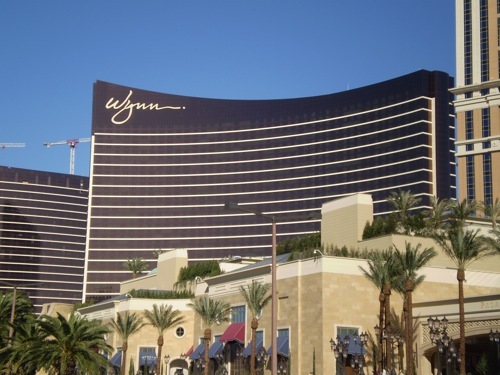 This is the Wynn hotel located right across the street from where I stayed. It’s very high class and the stores inside the promenade are very pricey. I saw a pair of golf shoes for $2,400. The restaurants and food options found at the Wynn are also worthy of being mentioned. I ate at a place inside called Tableau. Nothing like a $75 steak to fill the belly after a long day of sight seeing. Directly to the left of the Wynn is another identical tower currently being built as an addition called Encore. I’m very jealous of Steve Wynn. 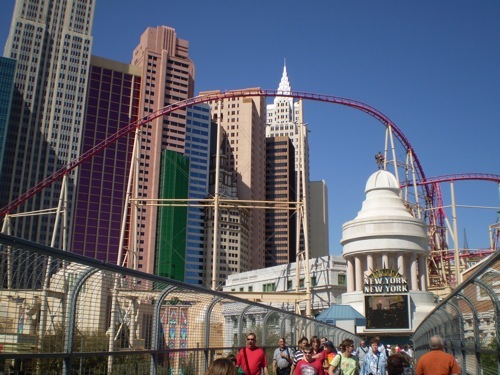 This is the New York-New York hotel located towards the beginning of the strip. Inside is a carefully designed replica of the streets of New York. The outside is made to look like SoHo, the Brooklyn Bridge, the Statue of Liberty and even has a roller coaster taking you inside the hotel. I had a famous New York style hot dog at one of the eateries… yummy! The Flamingo hotel was across the street from Caesars Place where I took this picture. As you can see by the huge graphic, Toni Braxton is currently performing there. The Elton John store was located inside Caesars Place, where Elton is currently performing. His show was sold out for everyday I was in Vegas. I should have ordered tickets before I went. I really wanted to see Ray Romano perform at the Mirage, but I was leaving to go home on the 21st. So much to see, so little time! 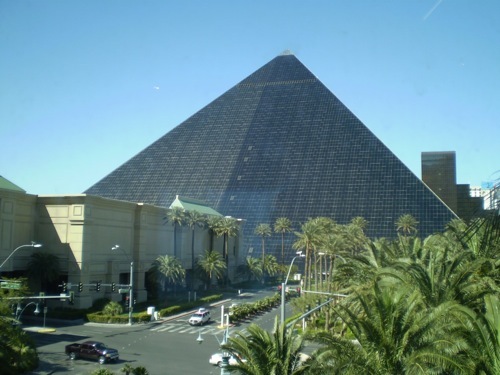 This is the Luxor hotel, which has the best shape of any building on the strip. The inside is no different; made up to look like an ancient pyramid. Each room inside has a slanted roof as would be expected. It’s also quite dark inside, which adds to the atmosphere. 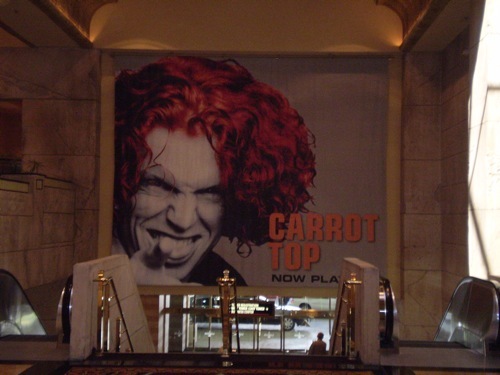 Comedian Carrot Top has his show at the Luxor. It was also sold out when I tried getting tickets. 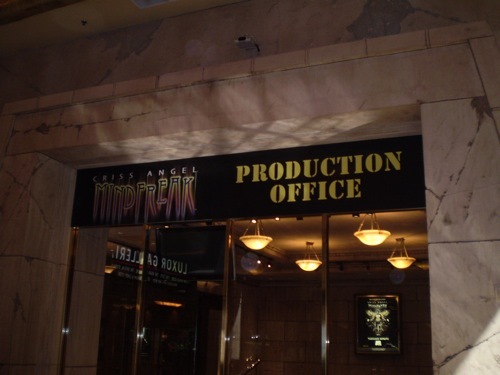 For those of you familiar with Criss Angel and his show on A&E, this is his production office as seen on the show. Criss wasn’t currently in production when I was there, but I was told he was in the building. He currently lives at the Luxor in a suite. 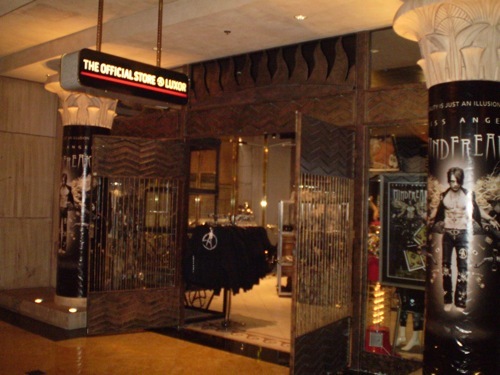 The official Criss Angel store has some of the original props and artifacts on display that Criss has used in previous episodes. 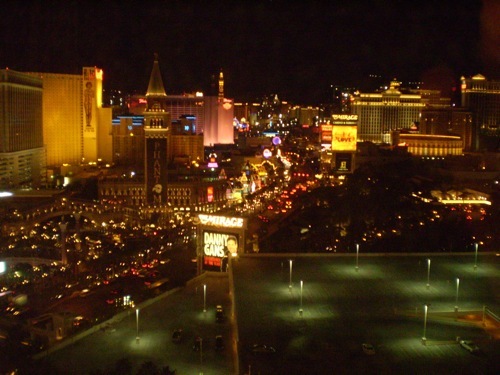 The Las Vegas strip as seen from my hotel room. Last time I was in Vegas I stayed at the Wynn and it was wonderful but I didn’t go to shows like you. I spent most of my time running up and down the strip trying to take it all in, the blue man group was all booked up when I was there so I was unable to see them, maybe next time. So much to do in Vegas, so little time. I LOVE VEGAS! I will be going there in April. We usually get good comps when we go because we gamble and win a good amount of money. Jackie: Where do you normally stay? 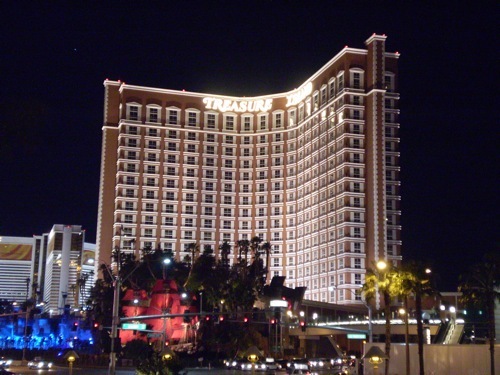 The Flamingo, but we stay in the new rooms with the Comps (for Free) and we also have Comps for TI, Mirage and Belagio. I think just getting Comps alone is a fun game. toni braxton? carrot top? vegas is where has beens from the entertainment industry go to die. its the same as old people and Florida.